About Silence is a performance text that I am making available for free to anyone who would like to perform it. 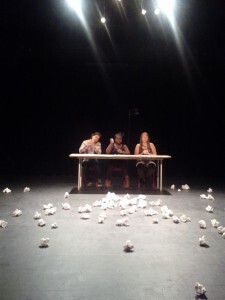 The performers do not see the text until the performance begins; this means the text is printed out and placed face down on a table for the performers to turn over and read once they start. All of the lines must be said in order and no lines can be skipped. If a performer starts a line, they must complete the entire line (even long, paragraph-length lines). There are no characters or set rules about which line each person should say, except as number one above. This means that the performers will choose which lines to say in the moment of performing the piece. The text is printed on paper and at the end of each page, or whenever a performer wants to, the page should be crumpled up and tossed on the floor. Some performers do it literally at the end of each page, while others hold pages back and crumple them when they feel like it. The performers stay seated throughout the performances and speak directly to the audience and each other. If two performers start saying a line at the same time, they should try to synch up so that the text is audible. The performance itself becomes about the moments of silence in between the text as we consider what was just said or anticipate what will be said; it is also about the choices the performers make in the moment. No two versions of the piece have ever been the same, even though the text has only occasionally changed (and only modestly). Typically, the performance is accompanied by a score of music by [zygote]. To gain access to the script, fill out the form below stating who you are and what you’d like to use the piece for (i.e., teaching, professional performance, just to read, etc). You will be sent a link to the script directly as a PDF. You must not publish the text on any websites (even for learning purposes internally at universities). You must not edit the text IN ANY WAY. There are dirty words and adult themes in this text…you may not edit these out under any circumstances. Please credit me as follows: About Silence written by Peter S Petralia, first produced by Proto-type Theater. Please also add the url drpetralia.com to any promotional material, programs, etc. I request that as payment for the text being given to you, you post a video of your performance of the piece (even if it is a classroom reading), which I will share on this website. I also request a few photos. After you perform the text, I ask that you send a quick note to say what it was like for you that I can also post on this website. You may choose to follow the performance rules laid out above, but I am fine if you want to do something totally different. If you do, I’ll look forward to seeing what it is like in your video. I hope lots of people take this up and enjoy the text! Contact me if you are interested in using it!